As Kelly Johnson’s grand slam sank deep into the right field bleachers and into the outstretched arms of the ecstatic Diamondback fans on Saturday night, you could see Matt Capps’s shoulders slump just a bit. It was his second blown save in the past four attempts. It was his fourth home run of the season – three more than he allowed in a Twins uniform all last year. I’m one of those sick individuals that likes to rewind those cataclysmic events and re-watch them in slow-motion several times. While reviewing the Johnson grand slam, Capps’s location on the rubber before the pitch jumped out at me: Capps was set-up on the far left side. It struck me as odd because I had thought Capps was a straight-up type of pitcher, one who uses the middle of the rubber and chucks strikes. After all, that was what the Twins said they loved about him, that he rears back and throws strikes. Yet, after checking the available footage, I found that Capps was indeed working on the extreme left-side of the rubber when facing lefties so far this year. As you can see Capps is straight-up, almost dead-center of the pitching rubber. 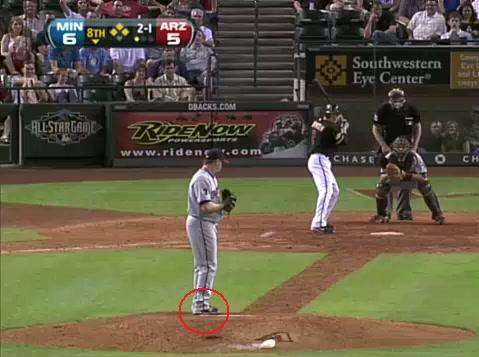 Capps’s shift at Chase Field was not just a one batter or one ballpark change, either. 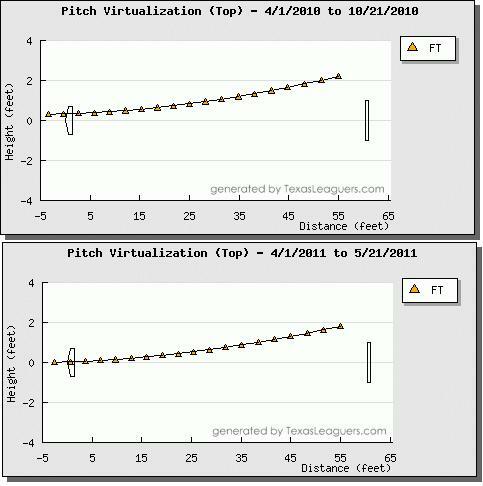 Pitch F/X charts found at Fangraphs.com shows that Capps has made some wholesale adjustments to the way he approaches hitters. In general, for most of his career, Capps was indeed a straightforward pitcher, beginning near the center of the rubber against both lefties and righties alike. This slowly began to change in September of last year. For the vast majority of the season Capps maintains a similar release point but then, for whatever reason (coaching, comfort, experimenting, etc), he began to set-up on the first base side of the rubber when facing lefties. Twins pitching coach Rick Anderson feels staying at one spot on the mound - which most pitchers do - will help Liriano settle down. Andy feels Liriano gets so wound up over strikeouts [then] throws too many sliders and doesn’t execute like he can. It makes little sense to me that Anderson would wean Liriano off of it while encouraging Capps to adopt it. While this lateral movement may have helped him against his same-sided foes (574 OPS in ’11 versus a 719 OPS in ’10) it seems to have hurt his performance against left-handed hitters. After limiting lefties to a 645 OPS with two home runs in 146 plate appearances, southpaws have a 784 OPS with three home runs in just 44 plate appearances. The overall small-sample universe that a closer works in can have a lot to do with the fluctuation of their numbers but Capps’s rough patch against lefties may have to do with this very mound modification. Below is a pitch f/x graph showing the movement of his two-seam fastball to lefties. 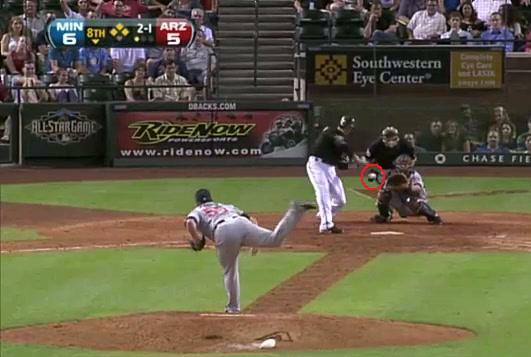 In the top one from 2010, Capps was painting more of the outer-half of the strike zone. 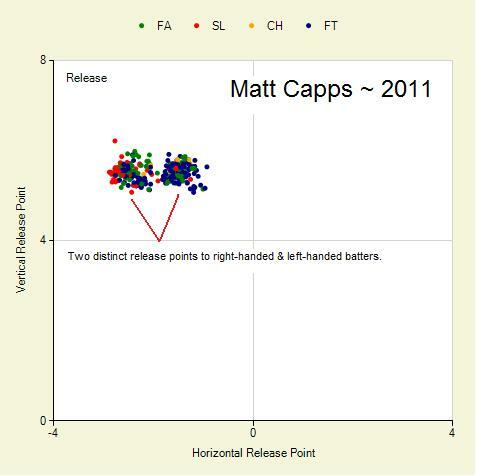 This season, from his new release point, Capps is cutting the plate in half on average. 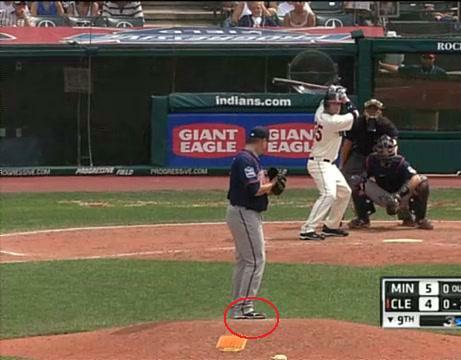 In the instance of Kelly Johnson, seen below, not to mention Luke Scott and Johnny Damon, all of Capps’s long balls came in the form of two-seam fastballs that caught too much of the plate. Last year Capps had a terrific season after coming to Minnesota. In his short stint with the Twins, he racked up 16 saves in 18 opportunities and posted a very good 2.00 ERA in 27 innings of work. In that time, he allowed just one home run while getting hitters to swing at a large swath of pitches out of the strike zone (38.4%) and coaxed a high percentage of groundballs off of his opponents’ bats (53% GB%). This year hitters have laid off most of his out-of-zone offerings (28%) while elevating far more of his pitches (29% GB%). I would surmise that this tremendous decline in worm-burners has to do with leaving too many pitches out over the plate rather than on the edges where hitters would turn them over. With a bullpen in disrepair as it is, the Twins need Capps to shutdown teams in situations just like he was asked to on Saturday night. 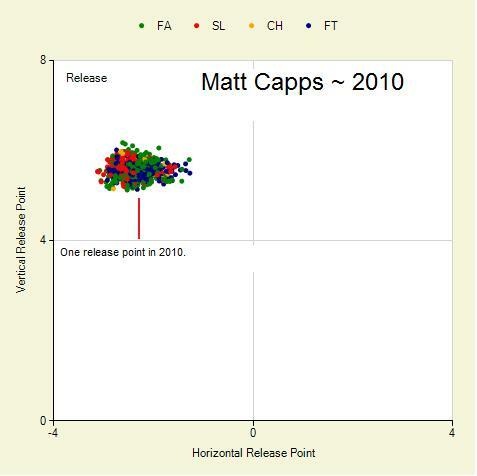 Unquestionably, Capps is a strike-throwing closer without the swing-and-miss stuff of vintage Joe Nathan. At the same time, he’s also very adept at retiring hitters for long stretches of time, as he showed last year. The trick for Capps is avoiding the meaty part of the plate.